I think it’s safe to say that, after living and being a journalist in Columbia, Mo., for four years, I know the area pretty well. I wouldn’t dare to presume I know it better than anybody who’s grown up there or lived there for a number of years — but I’d like to think I got to know my way around. So it’s odd that I never paid homage to the McBaine bur oak tree until recently. The McBaine bur oak tree on Route K, south of Columbia, Mo. 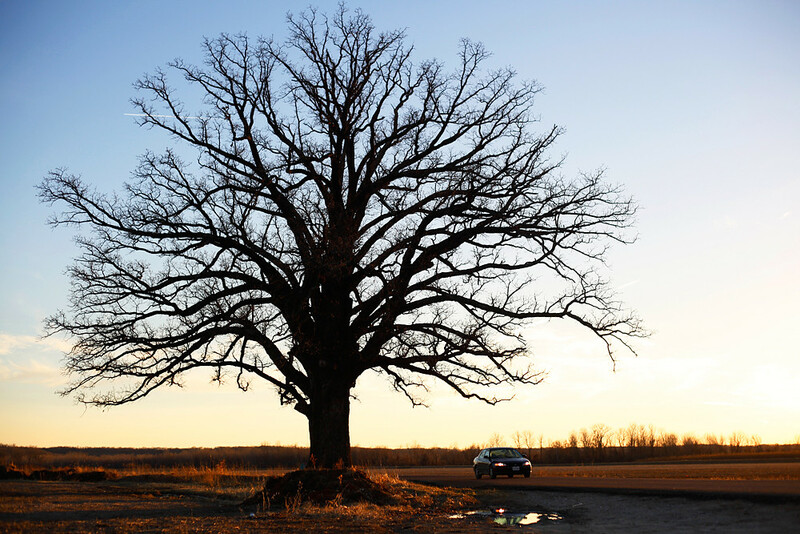 Also known as “the Big Tree,” the bur oak tree is… well, big. Located between a soybean field and Route K, the tree measures 90 feet in height, its canopy stretches 130 feet and its trunk is almost 24 feet in circumference. Almost 24 feet. Wow. Do you know of any other trees on whose trunks you can project the shadows of two people standing three feet apart and about five feet from the tree? (Left to right) Me. Jeff. On a somewhat related note: The light, when Jeff and I arrived at the tree, was gorgeous. But it was fading fast. Check out what are currently our Facebook profile pictures, below, which were taken five minutes apart. I just came across your blog this morning while looking for photos of Columbia’s burr oak. You take some lovely photos, and I hope you don’t mind that I used one in today’s post (http://runningwitholiver.blogspot.com/2011/04/weekend-of-firsts.html). That’s fine. Thanks for notifying me, giving me a byline and linking to my blog, Tina. That’s far more than what many people do.